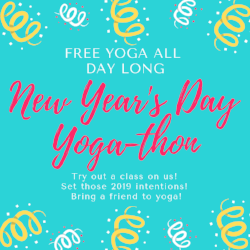 TEN HOURS OF FREE YOGA ON NEW YEAR’S DAY! SET THOSE INTENTIONS! CLICK ON THE SCHEDULE PAGE TO REGISTER FOR A CLASS! TAKE ONE OR TAKE THEM ALL! !